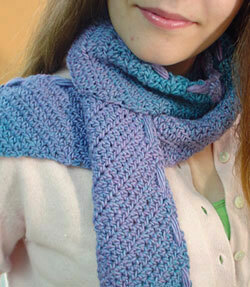 Crocheted at a slant, or bias, this self striping yarn creates a dramatic effect. w South West Trading Co.
finishing: cut 5 lengths of yarn 14 inches longer (7 inches hang from each side) than your scarf, weave into every other hole that was made on the decrease edge. YOU'RE DONE!! may be distributed freely for personal use only.